My Thanks to John Fraser for the match report and photographs. Musselburgh Athletic: Ronnie McPherson, Gary Cennerazzo, Chris Gordon, wes Mitchell, Scott Gibson, Adam Nelson, Danny Kelly, Paul Currie, Ryan McCallum, Chris King and Paul Tansey Subs: Matty King, Scott Devlin, Andy Porteous, Ian Ramage and Derek Polowj. Penicuik Athletic: David Livie, Graham Gallagher, Kris Steel, Matthew Lynch, Brian Foster, Kevin Milne, Ryan Gay, Keith Barr, Martin Cameron, Grant Killin, Darren Moonie. Subs: Graeme Cole, Ross Montgomery, Colin McDonald, Dean Jones and Mark Cowan. Referee: Gavin Ross. Assistants: Michael Banks and Gavin Duncan. Chris King produced a super show for Musselburgh as they claimed a place in next season’s East Region Super League. The game was over as a contest by half time as Musselburgh ruthlessly punished their visitor’s errors and went in for their cup of tea with a three goal lead. Penicuik were slow to settle and nerves seemed to be affecting their performance in front of Musselburgh’s biggest crowd of the season. Off side halted the first attacks at both ends of the pitch before Gay failed to control a Lynch free kick and the ball rolled out for a goal kick to the home team. Musselburgh took the lead in eighth minute. A clearance from the visitors defence went straight to Cennerazzo who had all the time in the world to cross the ball into the heart of the Penicuik penalty area. The ball dropped between Lynch who was deputising for the injured Meikle and goalkeeper Livie and KING notched the first of his hat trick with a first time finish. As Penicuik rocked, King passed up a gilt edged chance when he slipped the ball past Livie’s left hand post when clean through. Slowly Penicuik came more into the game as Musselburgh seemed to be content to sit on their lead. In the fourteenth minute, Steel headed over the bar from a Gay free kick after a Currie foul on Steel. Cameron then headed a Gay corner over the bar as Penicuik rallied. The next three Penicuik attacks were stopped by the assistant’s off side flag against Killin and Cameron twice. In the twenty third minute Penicuik were again caught off side as a Gay free kick came in. Two corner kicks from Gay were cleared by the home defence without McPherson being troubled. After enjoying their best spell in the match another bad mistake in the Penicuik defence gifted Musselburgh their second goal. Livie attempting to catch the ball spilled it right at the feet of CURRIE who had a simple task to side foot the ball into the net before rushing off to the touch line screaming in delight to celebrate his strike. Penicuik’s heads were well down and three minutes later found themselves heavily punished for yet another mistake. Lynch was penalised for a challenge on Currie at the edge of the eighteen yard line and KING made the task of beating the wall look easy as he placed the ball into the net via the under side of the cross bar. King was hungry for his hat trick but his free kick following a Milne foul on Chris Gordon dipped over the cross bar. Penicuik’s only hope was an early goal in the second half but Cameron headed over the bar from a Lynch cross as the home goal keeper had still not been called on to make a save. Ten minutes into the second half any thoughts Penicuik had of getting back into the game were killed stone dead as KING completed his hat trick, heading home a Tansey cross past the stranded Livie. Both King and Currie were prominent in midfield as Musselburgh dominated play but King was fortunate to escape with a quiet word from the referee when he took a kick at Foster as the Penicuik defender shepherded the ball out for a goal kick. With twenty minutes of the second half gone, King was substituted and at the same time Penicuik took the opportunity to put Cole, McDonald and Montgomery on in place of Cameron, Moonie and Killin. Tansey was causing the Penicuik defence problems down the left wing and Livie was fortunate to get his finger tips to a dangerous cross but was unable to knock the ball to safety. Penicuik escaped further punishment as McCallum could not quite connect with the loose ball. 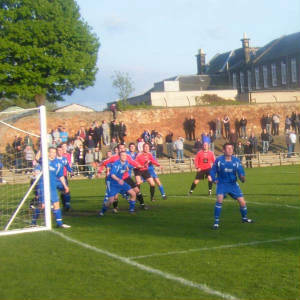 Penicuik enjoyed another spell of pressure but could still not call McPherson into action as the ball was unceremoniously despatched on two occasions high into the neighbouring school playground, Musselburgh’s equivalent of Row Z. Gay had the opportunity to create something for Penicuik but his corner kicks and free kick deliveries came to nothing. 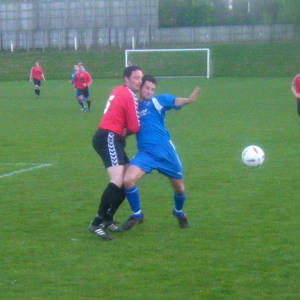 As nothing fell Penicuik’s way, the hard working Milne was booked for dissent after a foul had been given against Cole. With twelve minutes to go McDonald netted from a Milne pass but yet again, the assistant’s flag was in the air for off side. In the seventy ninth minute, another Tansey thrust was stopped by Lynch with the Penicuik man picking up a yellow card and a penalty being awarded to the home side. Livie got a hand to CURRIE’S effort but could not prevent the ball going into the net for Musselburgh’s fifth goal. With five minutes left McPherson was finally called into action when he had to finger tip a Steel effort over the bar for another fruitless Gay corner kick. Musselburgh ran out convincing winners against a very disappointing Penicuik team and will be favourites to go up to the Super League as winners of the Premier Division.